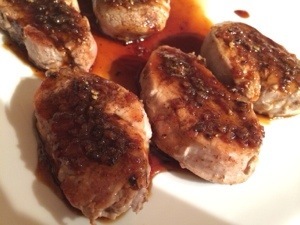 In a small saucepan, combine the bourbon, brown sugar, vinegar, soy sauce, garlic and pepper. Bring to a boil; cook until liquid is reduced to about 1/2 cup, stirring occasionally. Meanwhile, combine the chili powder, cinnamon, salt and allspice; rub over pork slices. In a large skillet coated with cooking spray, cook pork over medium heat for 2-4 minutes on each side or until tender. Serve with sauce.